Our "nerd" level went up another notch this past weekend. 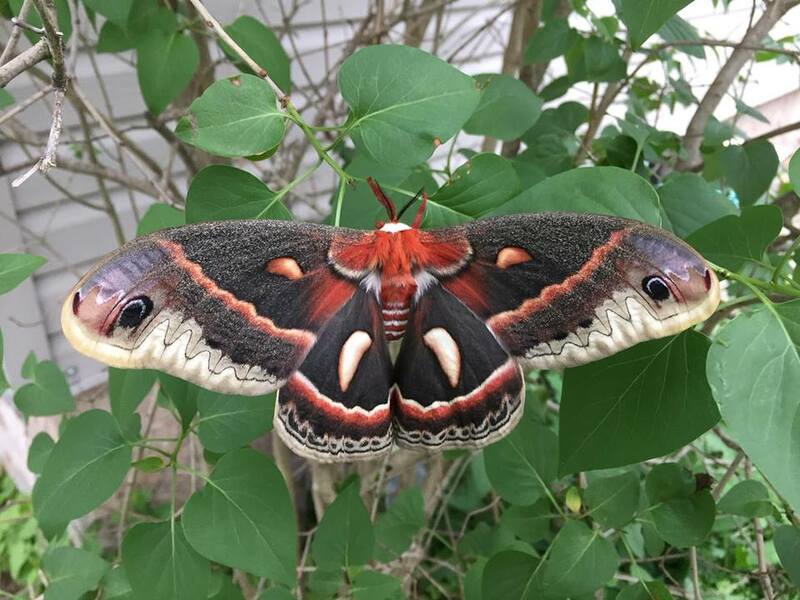 I became quite enthralled earlier this Spring, when a friend of ours released a Cecropia Moth on her property. She had found the caterpillar crawling across their lawn last summer. 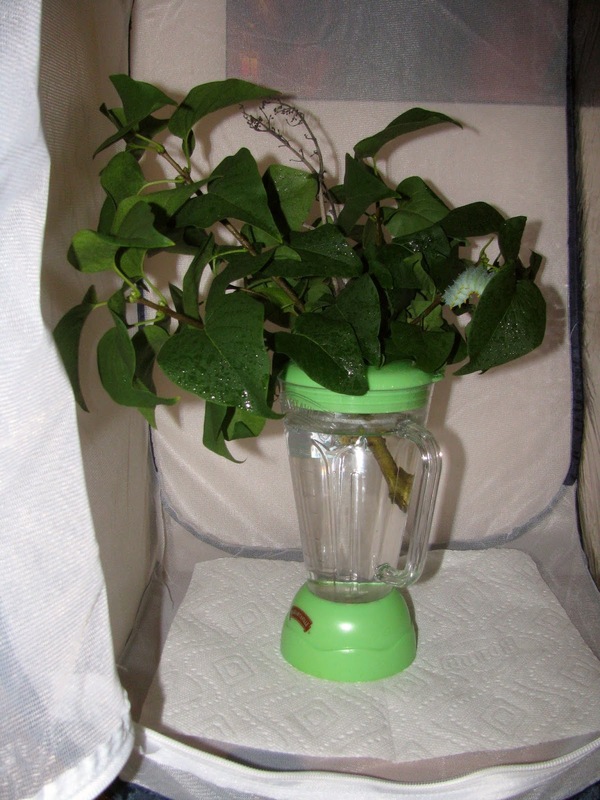 She had no idea what is was, but being a fellow nature nut she did some research, and took on the project of raising it. Long story short, she took it in, cared for it, it made it's cocoon, emerged in the Spring, attracted a mate, they made lots of babies, and Rob and I went over to her house last Saturday to pick up one of those babies. I've really shortened what is really quite a remarkable act of nature. 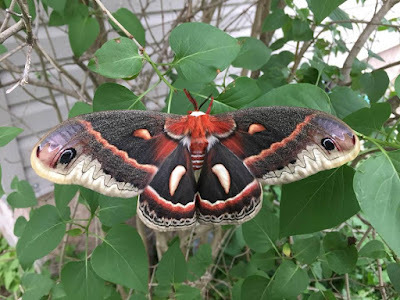 I suggest you visit her Facebook group, Wild Eyes Pixs by Barbara Canney and check out her Cecropia Moth album to see the whole story in pictures. 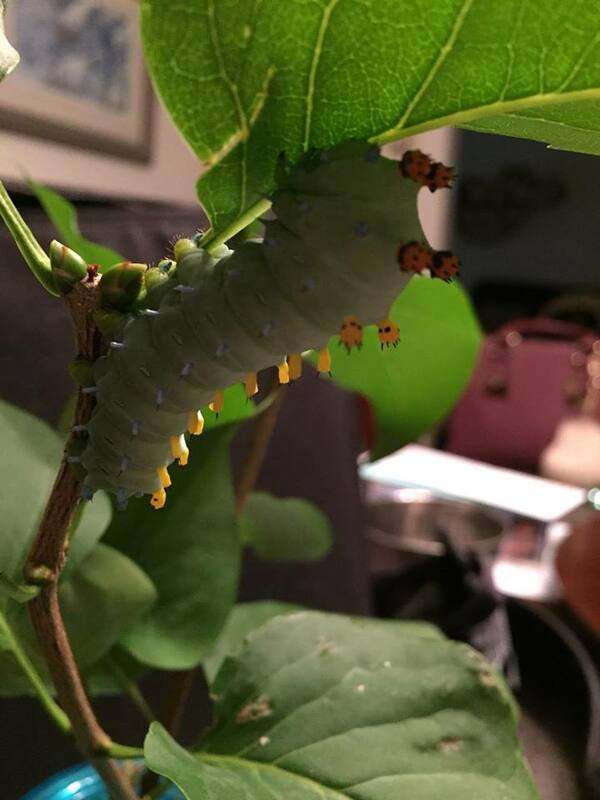 She posted a couple months ago that the caterpillars were available to raise to people who had lilac bushes, and would care for it through all its stages. I was immediately interested, but wanted to make sure it was something I thought we could do. It was also right before my trip to Alberta. After checking out this blog about raising the moths, and talking to Rob about it after I returned from my trip, we decided to take this project on, and went to pick up one of the last remaining 5 caterpillars she had left. Rob and I watched the movie the day after bringing him home. I was a little worried when we first brought him home. He didn't move from his spot on the branch he was on, and didn't seem to be eating. Turns out he was going through something called "enstar", it's like a molt, and caterpillars do this five times before they become a chrysalis. After this he was a lilac leaf eating and pooping machine! And I was so happy! He's eating away in Magaritaville! After work today I moved him into the butterfly enclosure I had ordered for him. I've had it set up all week but I wanted to give the cats a bit of time to adjust to it, as it's large. 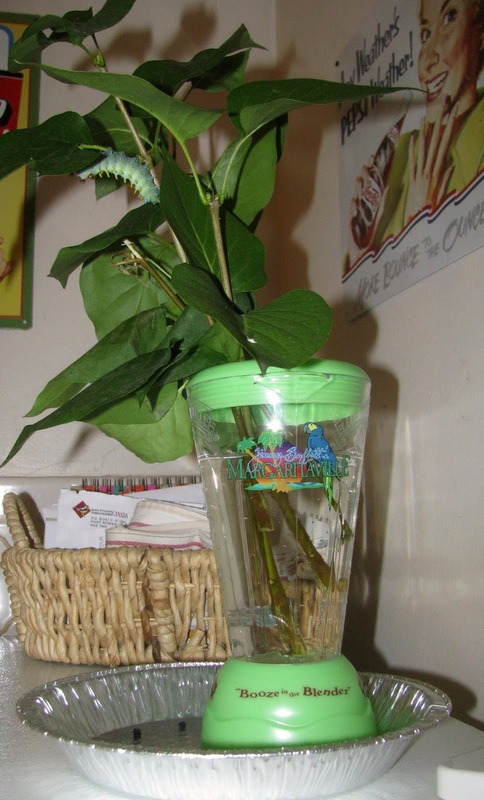 Heimlich will remain here happily eating his lilac leaves for a few more weeks, and then he will make his cocoon. 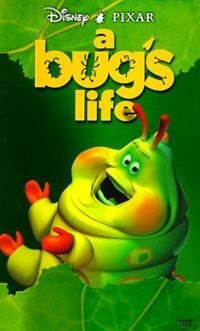 Stay tuned for more updates on Heimlich as the stages of his life cycle continues. I had no idea that Heimlich was based on the Cecropia caterpillar butvit sure makes sense. 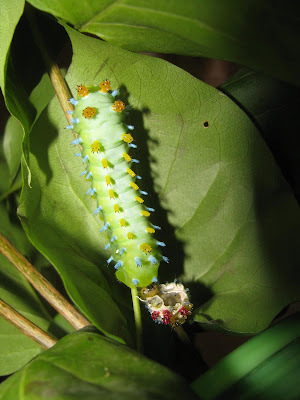 Although when I saw that movie I had no idea what a Cecropia caterpillar or moth was! Thrilled to bits that we get to experience this journey together! Such fun following your blog while watching the progress of mine. This is still crazy that we are able to raise these cuties!